John McLaughlin, TV Pioneer Of Raucous Political Punditry, Dies At 89 : The Two-Way McLaughlin's provocative political talk shows anticipated the current TV verbal battleground. He knew he was breaking the traditional mold of political talk shows as forums for polite disagreement. 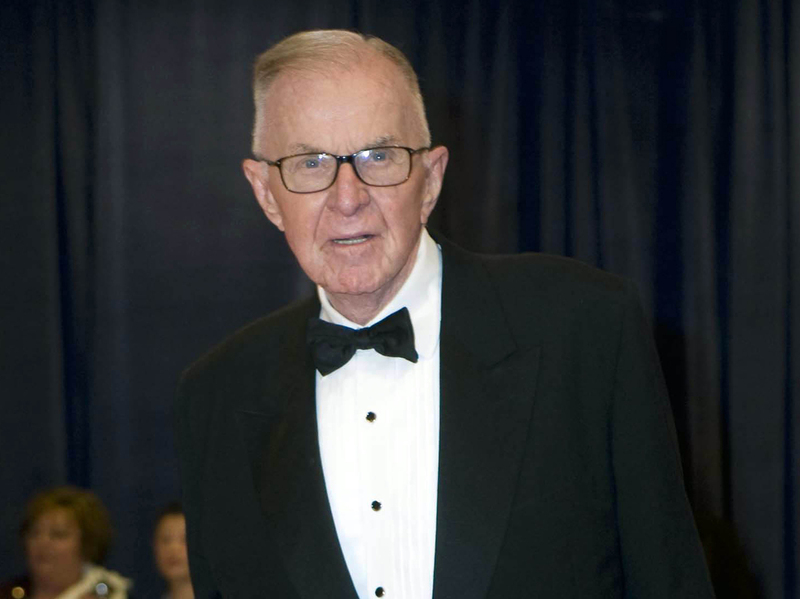 John McLaughlin arrives at the 2012 White House Correspondents' Association Dinner in Washington, D.C. McLaughlin, the conservative host of The McLaughlin Group television show that pioneered hollering-heads discussions of Washington politics, died Tuesday at the age of 89. John McLaughlin, the former Jesuit priest who reinvented himself as a political candidate, speechwriter and then the acerbic host of the long-running public affairs talk show The McLaughlin Group, died Tuesday at his home in Washington, D.C., at the age of 89. Fans of his show, which debuted in 1982, will remember how the conservative McLaughlin scowled at his hand-picked panel of Washington insiders who professed expertise on everything from U.S. policy in Central America to predictions on how long President Bill Clinton might survive the Monica Lewinsky scandal. Panelists such as Patrick Buchanan and Eleanor Clift were encouraged to shout out their objections to each other's views. And no opinion was too precious to escape McLaughlin's interruptive judgment expressed in a concise declaration: "Wronnng!" McLaughlin knew he was breaking the traditional mold of television political talk shows as staid and restrained forums for polite disagreement. He favored journalism as entertainment, telling the Associated Press in 1986, "I began the group as the talk show of the '90's. ... The acquisition of knowledge need not be like listening to the Gregorian chant." McLaughlin was born in Providence, R.I., in 1927 and joined the Jesuit order as a young man, earning two master's degrees from Boston College and a doctorate in philosophy from Columbia University. He wrote and edited the Jesuit publication America for several years before running for the U.S. Senate representing Rhode Island in 1970. He lost that race, but he landed in Washington anyway as a speechwriter for President Richard Nixon. Even at the height of the Watergate scandal, McLaughlin remained a Nixon loyalist. Through his White House connections McLaughlin found the funding to start The McLaughlin Group. At its height, it was broadcast on 297 PBS stations as well as the three NBC stations, with an estimated 3.5 million viewers, according to The Washington Post. For the first time in 34 years, McLaughlin missed the taping of last weekend's show.